Christmas at the SOUTH Pole! 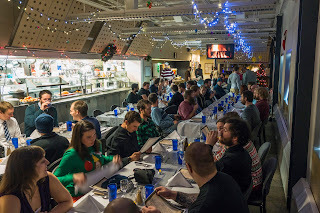 I feel very fortunate that I was able to celebrate Christmas at the South Pole this year. A Spanish reporter contacted me recently asking about what it was like to be a scientist who has to work during the holidays. For those who speak Spanish the link to the article is http://www.agenciasinc.es/Reportajes/Cientificos-de-guardia-por-Navidad. Thankfully, we didn't have any problems with the detector over Christmas so it was actually really nice here, and there wasn't much work to be done. Normally we work 6 days a week, more or less, except on holidays where we get an extra day off. As a scientist, my schedule is a little more flexible. Some days, I only have a few hours of work here and there. Other days I may be up very early or very late fixing problems. Last week we actually had a couple of issues. One of our servers died at 3:30 in the morning. For some of our servers this is not a big deal, and we can take care of it the next day. Unfortunately, this one was a DOMHub which means it is really important, and we had to deal with it immediately. My colleague Martin was on call, so he went out to the ICL (IceCube Lab) to fix it, while I monitored things from station. It turns out things were a little worse than we suspected so I ended up heading out as well to help him get things running again. After a few hours we got it all taken care of, and then came back for breakfast followed by a short nap before getting started on the rest of our TODO list for the day. Then, two days later, there was another failure, this time around 7 in the morning. This time I had to get up and head out to fix the problem. This involves getting all dressed up in cold weather gear and either walking or thankfully in the summer riding out on snowmobile. It was a quicker fix this time, and thankfully the last of our problems for a while. The Thursday before Christmas we had another exciting task. A few times a year, we have to go out and measure the snow accumulation on parts of the detector. This is roughly 80 pairs of tanks, each of which gets measures spread out over a square kilometer. We were able to use one of the Piston Bullies (pictured below) to drive around to the tanks. This gave us a few minutes of warmth between measurements. Overall, this took us about a day of work. Fortunately, we had a little help from a summer IceCube visitor, Gwen. Finally, on Christmas eve we had a ton of things going on here on station. The first big thing is the station Christmas dinner. 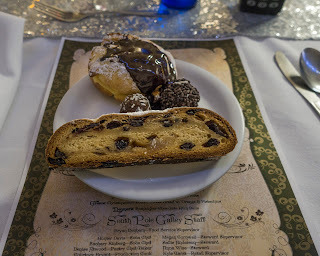 We had beef Wellington and stuff lobster tails with all sorts of European deserts. 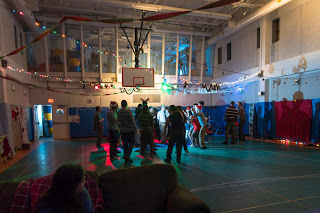 After this there was a big Christmas party with a live band dancing and socializing. Sadly, in setting up for the party, I smashed my thumb between a couch and a door, and now my thumbnail is still blue! Ah, how difficult life is here at the South Pole! Overall the past couple of weeks have been really good. I do miss my family here. I don't get to talk to them much due to limited satellite access and different time zones, but as I think I have said in the past, I am very fortunate to be able to work with such a great group of people here at the South Pole and in the IceCube collaboration. I feel like the work I am doing is very rewarding. I am excited about the science that IceCube and the IceCube collaboration are doing. On top of that, every so often I stop and think, "Holy crap, I am at the South Pole!" I am looking forward to continuing this work for the next year and seeing what the Antarctic Winter holds for us! I hope you enjoy some of the pictures below. I finally made it out to the Ham radio rig at the South Pole. Usually you access it remotely from the station, but it is nice to know where the actual hardware is in case I have to fix something. Martin and Gwen measuring snow buildup on the IceTop Tanks. We found this makeshift Christmas tree out near the materials area of the station on the way back from measuring snow. It is mostly made of cargo straps! Our station doctor poses with our party coordinator. They are really getting into the Christmas spirit. I brought a bunch of the Christmas cards I received from the students at Whitesburg Christian Academy to our party, and some of the people really appreciated reading them! What Christmas would be complete without cheesy Christmas movies? Everyone gathered on Christmas Eve for an amazing dinner! Martin and I even got presents from the IceCube back in Madison, WI. Thanks everyone! 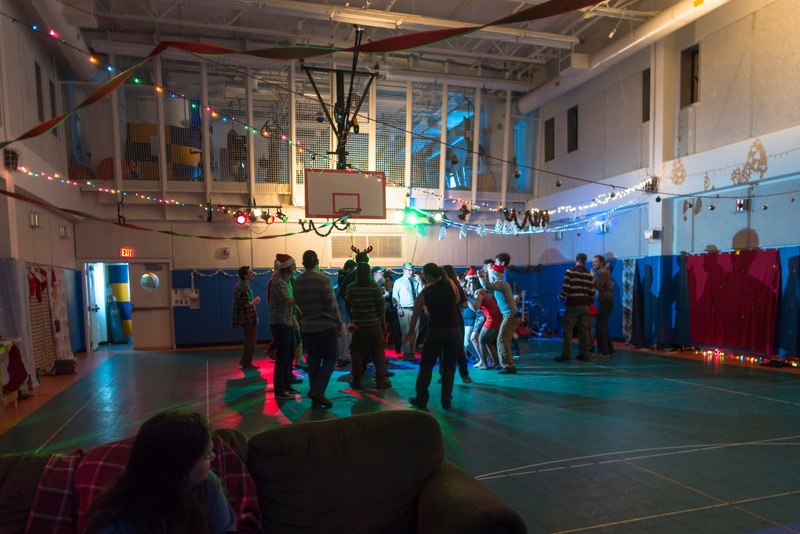 We wrapped the evening up with a party in the gym. It was a great Christmas! 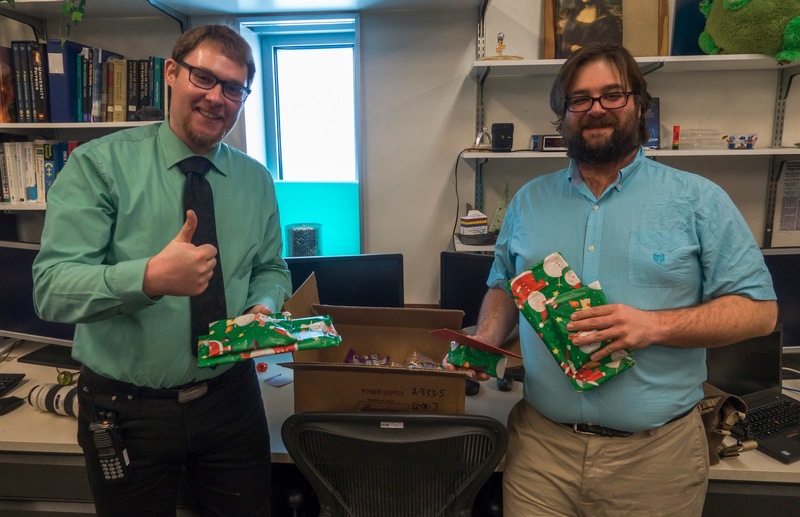 Our first live outreach and another care package at the South Pole! The past couple of weeks have kept us pretty busy. Since we got our cargo in, we have been working to do upgrades on hardware and software in the IceCube Lab (ICL). Mostly things have gone very smoothly, but occasionally, something in the upgrade process hasn't gone as planned and we have had to spend a few hours troubleshooting. We also had to carry what I have been informed was a literal ton of batteries upstairs in the lab. I would like to characterize this as routine (or I suppose not in the case of the batteries), but that seems to be the exact wrong word to use. Every day is different here, at least during the summer. Additionally, We have had more people shifting in and out of the station. While I look forward to the new faces coming in, I am definitely sad to see some of the old faces leave. Sometime in the next few days, we will be losing a couple people in the IceCube summer crew, but later in the week, we should be getting a couple new people in to work on different projects. It is somewhat bittersweet. There were a couple of more interesting things that happened over the past couple weeks, as well. 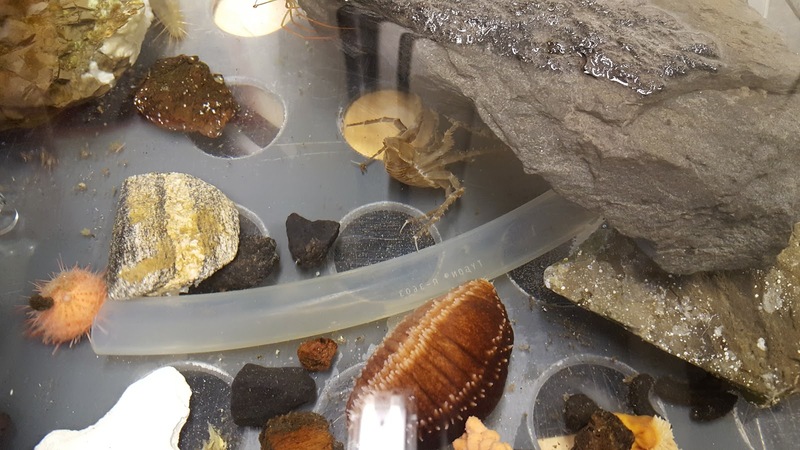 Last week we did an outreach over the Internet with a couple of schools up north: Avery Elementary 3rd-5th grade in St. Louis and Preeceville School 9th-12th grade in Canada. Martin (my winterover colleague), Jim and Chris (IceCube summer crew), and I all sat down at about 6am and gave a small presentation about our experiment and life at the South Pole. We got some excellent questions. I actually love telling people about the work I am involved in and in general astrophysics. The problem I ran into with this outreach is that I had to try to explain it to very young students. Normally, when I try to explain particle astrophysics, I am talking to adults, albeit with a limited science background, but I think this is the first time I have tried to explain it to 3rd graders. Overall, I think it went well. Mostly, for the younger group we focused on life at the South Pole with some science thrown in for good measure. Several of the questions that were asked were very good, especially for the ages asking involved. I look forward to our next outreach opportunity. Another very exciting thing happened last week as well. I received a care package from a friend of mine, Tim and some students from Whitesburg Christian Academy back in Huntsville, Alabama. It had some wonderful things in it, including some snacks (yay beef jerky!) and some other things that are very nice to have. I have to say, though, my favorite items in the care package were all the Christmas cards! The cards and envelopes were all decorated and each had a little message inside. I have a couple of favorites that I am posting below. I am very grateful for all the thoughts and effort put into the cards and care package. It is nice to know that people back home are still thinking about me! Everyone has been so busy here, we haven't done much decorating just yet. I am going to share the cards with some of the other people around station to help spread some Christmas cheer. Overall, we have had a good couple of weeks, and I am looking forward to the weeks ahead. Hopefully, after Christmas, things will slow down a little bit, and I will be able to blog more about the science we are doing here at the South Pole! A care package I received from Tim and some students at Whitesburg Christian Academy in Huntsville, AL! I selected two of my favorite cards, though they were all great! I am going to share the rest with the other people on station to help spread a little Christmas cheer. These were the same batteries we had to let dry out after they got soaked in transit. We had to carry them all up stairs after testing. I was told they weight over a litteral ton! The summer is a very busy time at the South Pole. There are many things going on and many things that have to get done while you have the extra support during the summer. I know I have mentioned this in another blog post, but I will clarify for those who aren't quite caught up. The summer season here lasts around three and a half months. During this time, we get planes and cargo and additional personnel to work on the station. This is our busiest time. Right now there are a little over 130 people living and working here at the South Pole. When the winter starts, which actually lasts about eight and half months, there are no flights in our out and only around 45 to 50 people are on station. We are effectively stuck here until the end of winter! So the point is that we have to take advantage of the summer while we can. 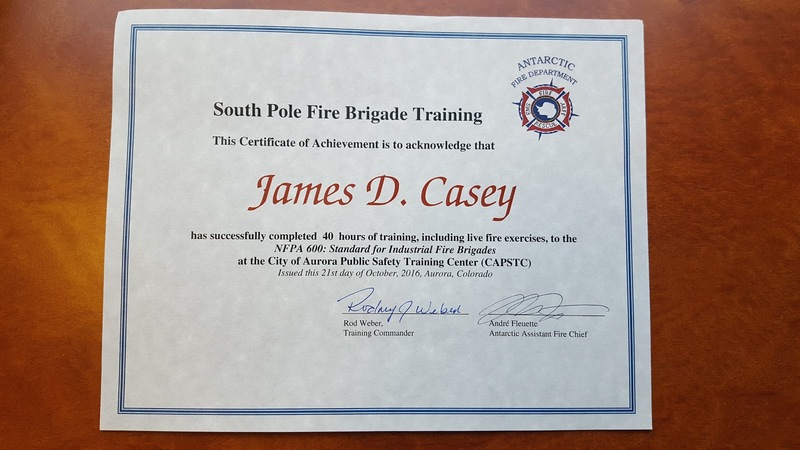 For me in particular, this means that I am involved in some extra training to prepare for the winter, and we are upgrading and fixing a ton of equipment. The problem is that when things go wrong, then you have a limited amount of time to get things fixed before planes stop coming in and all the summer people leave. Unfortunately, we are actually dealing with some of that right now. We had a shipment come in from the north for our experiment, the IceCube Neutrino Observatory, but the crate it was shipped in was damaged. The side was cracked and water had leaked in soaking a ton of boxes with replacement UPS batteries. Right now we are trying to assess the damage, but that is a difficult process. Some of the batteries look fine, but a few were completely ruined. Do we now risk using the batteries that look ok? What if it turns out there is more damage than we can really test for? If the batteries decide to die in the middle of the winter, we won't have any replacements! It is a difficult situation, and one of the things we have to deal with living and working in such a remote and difficult environment. Things are not all bad here, though. Today for instance was an amazing day. We had a visit from none other than Buzz Aldrin. I didn't get a chance to talk to him personally, but I did hang out with him and a few other people for a while after he got on station. He seems like a very interesting man, and I was very happy to be able to interact with him at all! I feel like living and working at the South Pole for the next year is a big life experience. More people have summited Mt. Everest than spent the winter at the South Pole, but even fewer have walked on the Moon! Suffice it to say that today was an amazing day, but that is life down here. You really never know what is going to happen or who will show up. It could be a day when equipment is sparking in your face (also happened today) or you could have Buzz Aldrin fly in for a visit... and I am loving all of it! Getting Settled In at the South Pole! I have spent the past couple of weeks getting settled in here. Mostly things have been fairly good. The one problem I have had to deal with was a small cold. Finally, even that seems to be pretty much gone. Since I have only been here for a couple of weeks, there is still a ton of training and acclimation going on. Mostly, I am getting pretty comfortable with the altitude. The dry air isn't too bad, thanks to lotion. The people here are great. I feel very fortunate to be able to be here doing what I am doing. As for training, I am getting a bit of a refresher on the work I will be doing for the next year. I haven't talked to much about the experiment I am working on, but that is mostly because it will take several posts to do it justice. For now, I will give a brief overview and describe some of my role in it right now. I am basically making sure the IceCube Neutrino Observatory continues to run and collect data and performing any routine calibration tasks. 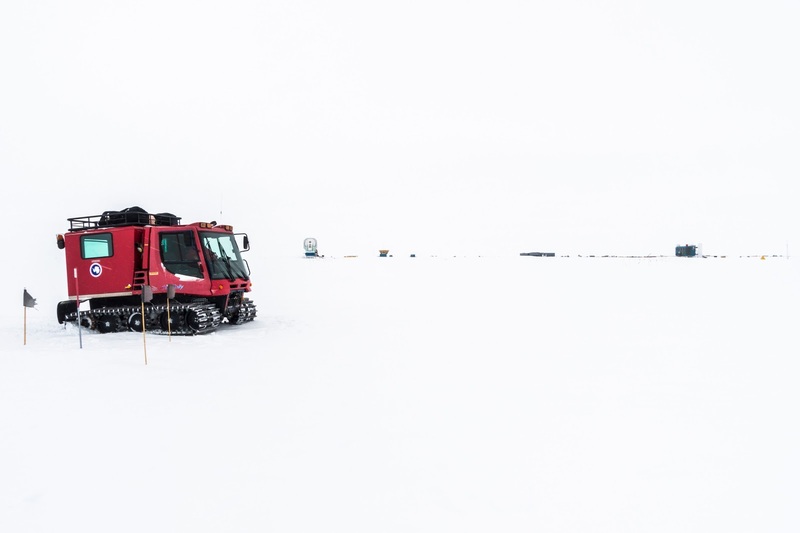 The experiment is designed to detect tiny particles called neutrinos that every so often interact with the molecules in the ice around the South Pole. Many people don't realize that the area here is covered with roughly 3km of ice. We have over 5000 very sensitive light detectors running from 1.5km to 2.5km deep that have been placed on 86 cables lowered into small holes that were melted into the ice. Of course the holes are all frozen back over now, so we have these detectors connected to wires that run into the IceCube Lab (or ICL). In the ICL are several servers that process all the information from these light detectors. It is my responsibility, along with my colleague Martin, to keep all of the servers running and fix any problems that arise. This could be anything from the network infrastructure including switches, cables, and firewalls to the custom hardware that collects the data from the light detectors in the ice. It is a big responsibility! Thankfully, most of the training we have been doing has been fairly thorough. We also have some support up North if things get really wonky, but most of the problems we should be able to deal with on our own without too much help from others. The training the past few days has mostly been on the networking side of things. This includes the layout of the servers, how the switches are configured, and the firewalls. 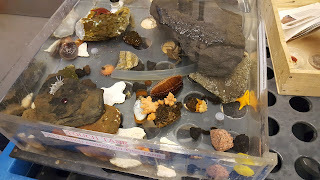 Next week, we will be going through some of the custom scientific hardware that actually collects the data on the surface (as opposed to the hardware frozen in the ice). Suffice it to say that there is a lot to learn on a project as big and complex as IceCube. As promised, I would also like to show some pictures! I am putting a few here, but check out the link on the sidebar to see the full album. I put together a couple videos for my undergraduate university UAH. So I took a pic at the ceremonial South Pole in my UAH sweat shirt. A pic from inside our library. There are tons of books on station. There are more books on the other side of that wall and then a large wall of books in one of the lounges. This is where we do most of our work. This is one of our lounges. The galley. This is where we eat. Just out for a casual stroll at the bottom of the Earth. 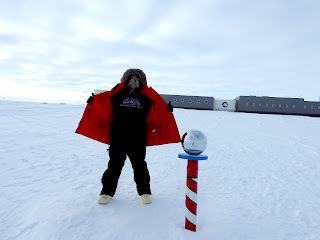 My Birthday at the South Pole! I am excited to say that I am now celebrating the first of my two birthdays I will be having at the South Pole. This marks the beginning of my year here. One interesting thing about this is that due to the timezone here, my birthday is almost an entire day earlier than it would be if I was back in the US. So I may be cheating a little and celebrating earlier. At the South Pole, we mostly use New Zealand time. This has to do with the fact that most of the flights into McMurdo are from New Zealand, so I think it makes things a little easier to coordinate if everyone is using the same timezone. That being said it is about 18 hours ahead of Central time. I suppose that by the time I get this posted, my birthday will just be starting in the States! So far, today has been fairly uneventful. I had a wonderful brunch with an nice big omelet and salmon and some great pastries. I have been told that the chefs who come here can vary in skill, but everyone seems to agree that we have one of the best for the next year! It turns out that he is from North Carolina, if I remember correctly, so I am looking forward to some good southern cooking this year! After that, I spent some time monitoring our detector (the IceCube Neutrino Observatory) with the other IceCube winterovers (my colleague for the next year and the two who will be departing in a week). We also had a small gathering to watch some aurora videos that were made by a winterover here last winter. He has actually spent more time here at the South Pole than almost anyone else. I am sure there will be more to say about him in the future as I have heard that he is going to be leaving for the summer, but returning to spend yet another winter here. After that I did some more checks on the detector and a small little task for another growing experiment that I watch called ARA. Normally, today would be a little more relaxing, but due to some issues with our power plant here, there has been maintenance going on the past couple of days. The station here at the South Pole is very isolated. This means that we have to generate all the power we use here. We have two large generators that power the station, and over the past few months there have been some problems with the system that switches between them. I don't know all of the details, but I know that now they are trying to fix it so we don't have to worry about it during the next winter. Since our experiment draws its power from the power plant on station, this can cause us some small issues during this maintenance time. Our experiment is very sensitive to power changes, so we have to be ready to fix any problems that show up. Unfortunately, there were a few problems during the work they were doing yesterday and we had to spend some time fixing problems in the detector. Hopefully, they will get the kinks all worked out soon so we won't have to deal with power issues for a while. If some of my terminology seems a little complicated or I seem to be glossing over details, I apologize. I am happy to answer questions in the comments. Your questions may even eventually turn into a post in and of themselves! I am still trying to get settled and balance work life and science with station life. 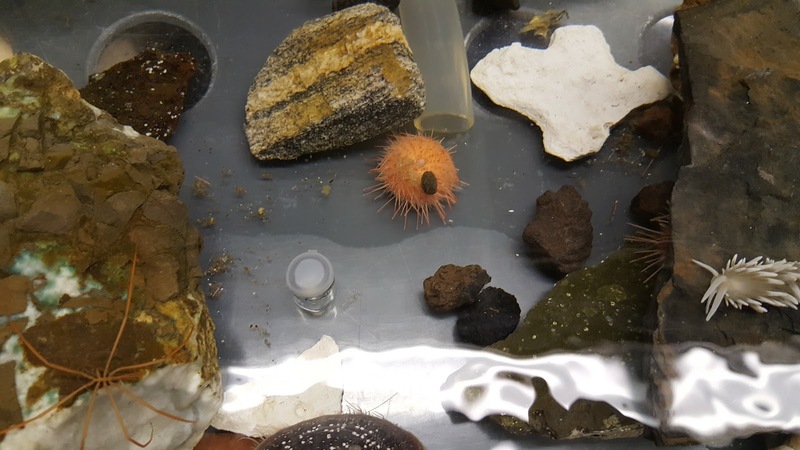 I hope to be able to spend more time in the future focusing on the details of the experiments here, but for now, the Antarctic summer is about to be very exciting for us with all the people coming into the station to work on the experiments. During the Antarctic winter season, which actually lasts around 8 months, there will be about 45 of us on station. During the summer, there can be over 150 people living and working here! We are all still getting adapted to the altitude, the cold, and each other. Many of us are still learning the details of the work we are going to spend the next year doing. So I am trying to express a balance of work and station life in general. That being said, I can't think of a better place to be celebrating my birthday! ready to get down to pole. The travel through McMurdo can be kind of tricky. summer. That being said, our delays were due to weather at Pole and maintenance issues. Thankfully, it was all cleared up today and we finally made it in! be that big a deal any more, almost like it the "new" was starting to wear off. to the comment, or I may even try to write blog post in response. One of the things you learn about the Antarctic program down here is that you have to be patient and make the best of the current situation. In particular, you never know when your plans will change. Actually, your plans are more likely to change than stay the same! That being said, I was scheduled to arrive at the South Pole yesterday, but due to some aircraft issues we have been delayed. There are definitely worse places to be delayed, though. There are tons of things to do around McMurdo if you are willing to explore. One of my favorites this time around has been the touch tank. There are a bunch of small aquatic animals you can pick up and look at and hold. Some look kinda freaky. If you are big into outdoor activities there are lots of things to do in your off time. There are a few places to hike or ski. Before you can do that, though, you have to go through some training. This basically consists of watching a 20 min video about how not to do stupid things and then a power point presentation with some details about who you have to notify if you go to certain places and such. Antarctica is a dangerous place, and there isn't a huge medical facility here. So if you get hurt or wonder off into a protected area or even fall into a crevasse you could be in serious trouble. But that doesn't mean you can't do anything challenging or adventurous. There is a big hill near by that I went up yesterday called Observation Hill or Ob Hill for short. If you can get to the top, you are rewarded with an amazing view, but it is one of those places that can be very dangerous so you have to be careful. The view of McMurdo from the top! There are a couple other places that I visited last time I was here, and I am hoping to be able to get over and see them again, but I tried to walk over a little bit ago, and the wind had picked up so that might have to wait a bit. To be honest, the cold isn't that bad. The wind is what is really uncomfortable. I will be adding more pictures as I am able. Usually, I like to get a few pics up that I am actually in, but I have been going out with other people who have cameras, and I end up having them take pictures of me with their camera. As soon as we can all get together and share our pics, I will have more, but that may have to wait until we start getting settled at the South Pole. In the mean time, I am going to try to get a few more around McMurdo so keep watching for more! I am also creating albums and linking to them in the sidebar on the right. There are more pictures there, and those albums will be growing or increasing in number anyway. I finally made it to McMurdo, Antarctica! The internet is limited here, so pictures will be up later. In the mean time, I posted an album from my time in Christchurch, NZ here! I had a blast while I was there and visited the botanical gardens. I took a ton of pics, mostly of flowers and such. I had to take as many as possible as I won't be seeing any more flowers or trees for a while! One of the most common questions I get asked about my last trip to Antarctica is "how do you get there?" As it turns out there are a few ways to get to Antarctica, depending on where specifically you are going. Many countries have established stations on the continent of Antarctica, but people involved with the United States Antarctic Program (USAP) generally end up in one of three main stations: Palmer, McMurdo, or Amundsen-Scott Station (The South Pole). McMurdo is by far the largest and is actually the hub for many smaller base camps. It is also the first stop for those of us going to the South Pole. As I am heading to the South Pole, I will detail that route of travel. The first step is to fly to Christchurch, New Zealand. There are two main routes that I am aware of from the United States. There are other routes if you are going through Europe or Asia, but I am not familiar with these at all, so I can't give any details for them. The first route is to fly from Dallas, TX to Sydney, Australia and then from Sydney to Christchurch. This was the route I took last time, and it is takes roughly 15 hours if I remember correctly to get to Sydney from Dallas. It is a LONG flight, not to mention you still have to take another flight after that from Sydney to finally end up in Christchurch. Similarly, the second route is from Los Angeles, CA to Auckland, New Zealand and then from Auckland to Christchurch. I took this route this time. This should take about 13 hours from LA to Auckland, but as it turns out, it took us a little longer. We were stuck on the ground for about 2 hours before we could take off due to some maintenance issues. So that flight took around 15 hours in the end, and again, it was followed by another albeit shorter flight from Auckland to Christchurch. After you get to Christchurch, you are met by representatives of USAP (the United States Antarctic Program). They get you to your hotel and help you with a few things here and there at the airport with scheduling and such. Within a day or two, you meet them again to get your ECW (Extreme Cold Weather) gear from the CDC (not that CDC, the Clothing Distribution Center!). As it turns out, most of the really heavy duty cold weather gear is provided for you at this point. You still have to bring some cold weather clothing, but the really expensive stuff is provided for you to use while you are on the ice by USAP. While you are there, they check your computers to make sure they are compliant and up to date to be on the USAP networks. They also check a couple medical things and give you a flu shot if you haven't had one for the season. They basically make sure you are all ready to go and then they ship you off an the next available opportunity! The next step is the flight to Antarctica. This is not a normal flight. It is operated by one of the military branches. The first time I made this flight it was on an LC-130. This time it was on a C-17. The flight on the C-17 is a faster trip taking only about 5 hours vs the 8 or so hours on the LC-130. Because the weather in McMurdo can be unpredictable, you are never quite sure when you will be flying out. In our case, we were scheduled to leave on Wednesday, but the weather was bad so we didn't actually get out until Thursday. Sometimes it can take even more time. There are even cases when people get on the plane and fly almost all the way to McMurdo and have to turn around and go all the way back to Christchurch if the weather gets bad during flight. Thankfully, this didn't happen with us! The shuttle picked us up at 5:15 AM and after checking in, breakfast, and some video briefings where we told about how to protect the environment of Antarctica while we are there, we hopped on the plane and flew out about 9:15 AM. Five hours later we arrived in Antarctica! Overall it takes several days to get here from the United States. The next step will be to get to pole, and I will detail that in a future post! 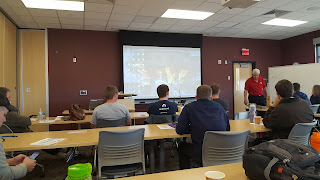 Fire training is mostly learning about emergency techniques to fight fires or at least mitigate the loss due to fires at the South Pole. The great thing about the trainers was that they were so willing to work with us and customize the training to meet our needs. 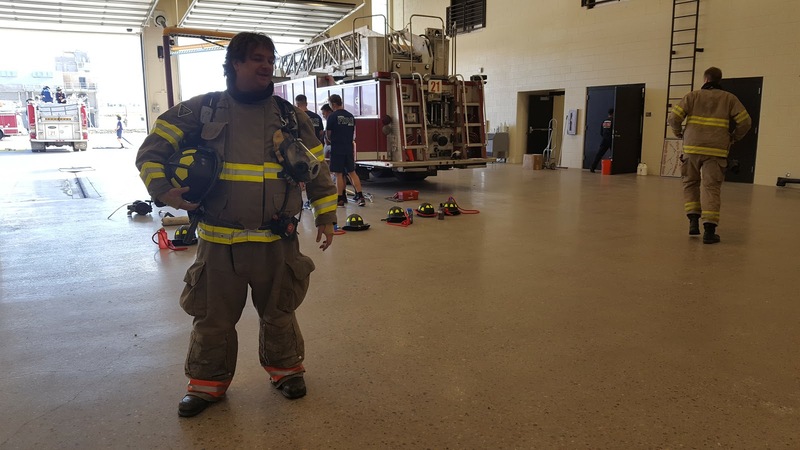 The first day we got fitted for some bunker gear for the week, and spent a little time getting used to it. The rest of the week we had classes about every thing from fire behavior to search and rescue. 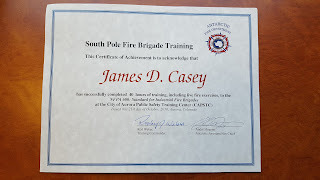 After the classes, we would go out in the after noon and actually put out fires using equipment similar to what we will actually have at the South Pole. This was a class on fire behavior so we have a better idea of how to put fires out. 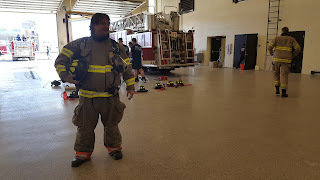 This is a picture of me in the bunker gear. As part of our training we actually went into the training buildings in full SCBA gear (breathing equipment) where we put out some of fires. At one point they had a fire going in a room where we got to experience temperatures of around 600F to 700F in our gear. It was a very controlled situation, but was still very eye opening. We had a wonderful set of instructors who helped us prepare for terrible situations that I honestly hope I never have to face. Having been through this limited amount of training, I have a much greater respect for the firefighters out there. The trainers never pushed us too far out of our comfort zones, but it was close enough that I am happy there are men and women out there willing to work in such a dangerous job day in and day out. I can't imagine how taxing that must be physically and emotionally. So, thank you to all those firefighters out there! After all of the training was done, we had a small celebration and some cake, and I even got a certificate! After we get to pole, we are going to be divided up into groups. Not everyone will be directly involved in the fire brigade, but all of us will have our part. After things settle down, I will post more about the other responsibilities and groups that will be operating down there to keep everyone safe. The past week has been amazing! I remember hearing about all the "team building" we would be doing up here in Colorado, and I have to admit that I was a bit skeptical. The truth is, however, that I think it was probably well worth it. I was able to meet a large number of the people I will be living with over the next year, and I really think it is a great group so far. We had a couple of people come in from Adventure Associates to facilitate the process, and I use that word purposely. They talked at the very beginning about helping us work out the ideas and methods that would help us resolve conflict among ourselves. Obviously, it was very guided, but I think it was useful. On top of that, it gave many of us the chance just to get to know each other in a safe environment, and I think that may help over the winter when things can be less than ideal. One challenge we did as a group that I was particularly fond of was on the last day. Basically, we had to do a big scavenger hunt, but with several limitations. We were given limited GPSes and a list of targets with puzzles we had to solve and some other rules about what we could and could not do. Without going into all the details, suffice it to say that we had to work together and coordinate our efforts as a group, and I am very happy at the outcome. Keep in mind, this is on a huge YMCA campus at around 8,000ft in the mountains of Colorado. We came together and approached the problem in a new way (which seemed to be a theme over the week) and were able to do what needed to be done. We weren't perfect, but no group ever has been, and we were able to work together and complete the challenge together. There were other things we did over the course of the week, both in the actually team building and afterwards in the evenings that I think will help us live and work together. I know there will still be conflict, but think we will be able to get through it without too much trouble. Lastly, I have to say that I was very inspired by the view in the region. Below are some pictures I took that really don't do justice, but may give you an idea of how amazingly beautiful it was. This is the view from the administration building at the YMCA. We saw this every day when we went to eat. I couldn't pass this one up. I think it is the most American picture I have ever taken! A few of us went on a hike Saturday after all the official team building was done. I saw this road leading up through the mountains and decided I had to have a picture. We saw some deer on the way back after the hike. They pretty much just tried to ignore us. This is one of my favorite pics I took. I went out just as it was getting dark and realized I had a great opportunity to catch the moonrise over the mountains. I had to sit and wait a bit, but it was totally worth it. On a side note, after I took this pic I went back inside to see how some of the pics turned out. Afterwards, I decided to head back out for a few more shots. My trip back out was cut short when I saw a bear walking around in the parking lot! I pretty much decided I was done wondering around in the dark after that. I have been in Madison, WI for training for almost three weeks. I am training to be what we call a Winterover. This name comes from the fact that I will be spending a full year at the South Pole. Specifically, I will be spending the winter there. During the Antarctic summer, planes go in and out of the South Pole regularly, and by regularly, I mean at least once a week or more. During the Antarctic winter, however, planes rarely if every fly to the South Pole. As I understand it, they have actually only ever flown in three times during the winter, and that was for big emergency situations. In general, once the last plane leaves for the season, you are stuck there for 6 months with almost no hope of getting out! For that reason, you have to go through all the medical and psychological evaluations that I talked about in a previous post. All that being said, my training now, is mostly on the technical side. Many people think of this as a scientific position, and to some degree it is. But the work I am going to be doing at the pole is mostly network and system administration. The IceCube Neutrino observatory is a large experiment that collects a great deal of data. There is so much data that we can't even get it all to the North through our satellite connections. Instead, we have a small cluster of servers located at the South Pole that collects and processes the data to select out only the most interesting parts. All of the data are saved and eventually shipped to the North on an airplane, but the most interesting data are sent through a satellite connection. While I am down there, I will be working to fix any problems that arise in the computers or network that collects the data and does the processing. For the first couple of weeks, my training was largely software based. There are many different custom applications that process the data collected by the detector. Even the hardware that collects the data has to be watched and occasionally fixed or upgraded. There is software that converts all the data collected to useful information, software that filters out the stuff we don't care about, software that does calibration, and even software that moves and saves information and files to the right places whether it is to the satellite or to disks to be sent north later. As a winterover, I have to know how these systems work and how to fix them if things break. This could be as simple as rebooting a server or as complicated as reading through tons of log files to try to figure out problems that don't make any sense! Thankfully, the systems are fairly well designed so it is usually not too much work to fix problems, and I should always have some support from the IceCube members up in the North to help with any really big problems. Though, in the end, it is the winterovers who have to implement most of these solutions, which is why there is so much training. This past week I have also been doing some network and system admin training. I have a background in network administration, so I am not seeing anything too far outside of my experience. The systems on this network are more advanced than the systems I have used in the past and there is way more thought put into the network as a whole, but the general concepts are pretty much the same. That being said, I think this would be very difficult and confusing if I didn't have at least somewhat of a networking background. If anyone was interested in one day working as a winterover for IceCube in the future, I would strongly recommend spending time learning Linux and general network and system administration. These are the skills that seem to be the most valuable so far. Spend time breaking and fixing computers. Installing all sorts of software that other Linux users and system admins use from day to day and try to learn how to use it in interesting ways. It doesn't hurt to have a PhD in physics, but it really helps to have a solid understanding of bash! (If you don't know what bash is, that might be a good place to start!) I am excited to be a part of IceCube in this capacity and to see how things work from this perspective, and I am really looking forward to my trip down to the South Pole! There are a surprising number of things that are involved in going to Antarctica, and the things you have to do can change based on what the purpose of your trip is and where you will be located. There are a few things, however, that are similar for almost everyone. The first hurdle that many people deal with is the medical tests. The tests vary depending on where you are going to be based and for how long. So someone spending a year at pole, like me, has to go through a number of blood tests and physical examinations and even a psychological evaluation. If there is a problem with any given test, you may or may not be able to fix it. The process also can be complicated by the large number of individuals all applying at near the same time. There is really only one organization that handles the medical approval for all of the "big" US bases in Antarctica, and it can take a while to get all of your medical documents processed. Suffice it to say that when everything is cleared and you are PQed (Physically Qualified), it is a bit of a relief. Additionally, many people visiting the South Pole or other parts of Antarctica go through specialized training. This can be anything from training on the work you will be doing to team building and fire and trauma training for those spending the winter. My training started about a week and a half ago. As I will be working on the IceCube Neutrino Observatory, I have been training at the University of Wisconsin with many other scientists and engineers who work on the detector every day up here in the North to learn how to fix problems and do regular maintenance on the detector. I have learned more about how all of the servers at the South Pole are laid out and interconnected and how all the hardware works. I did my PhD research using data from IceCube, but this training has given me a new perspective. I am now able to "look under the hood" to see much more of the detail that goes into collecting that data. In a couple weeks I will be starting my team building training in Denver. I will update more about that after I am actually involved. The last thing that immediately comes to mind is packing. This can be a little tricky. I'm sure most people think you have to go shopping for a bunch of warm clothes and find cold weather gear, but honestly the big things are provided for you. There is still some cold weather clothing you need to get, but it's really not as much as you'd think. The tricky part is trying to pack for a year away. There aren't many shopping opportunities at pole. You can actually buy things on Amazon and have them shipped down, at least until the end of the antarctic summer. After that, planes don't land for about six months. Though, I did hear an amusing story about this from a colleague who spent time at pole in the past. He said that a few Amazon sellers would cancel orders because they thought they were fake! For some reason they didn't actually believe there was a research station at the South Pole. There is also a small store on station, but it doesn't have too much. I went to the store on a short visit I took to the South Pole a few years ago, but I really don't remember too much of what they had beyond souvenirs. All that being said, you have to pack with the understanding that it may be difficult if not impossible to get the items you need or want while you are there. You have to pack clothes, toiletries, and even things to keep you entertained, though there will be more discussion about that in a later post. It turns out there are some nice facilities at pole to help keep you from getting too bored. On top of all that, you have a baggage weight limit! So you have to pack carefully. This has been difficult, but as I said before, you can ship things down so that helps. All in all, there is a great deal of preparation that goes into a big trip like this, and anyone looking to undergo a trip to the South Pole has some work to do ahead of time! The South Pole Adventure Begins! I recently received some very exciting news and have been waiting to post the details for various reasons, not the least of which being that I have been very busy dealing with many new responsibilities. As I posted in the past, I applied for a year long position at the South Pole. Originally, I was not selected as one of the two primary candidates. A little less than two weeks ago, I found out that one of the primaries would be unable to take the position, so I was asked to take his place. Since that time, I have left my job in Birmingham and moved most of my belongings into storage. Less than a week later, I started my training in Madison Wisconsin! As I have stated I the past this blog was started to fulfill many purposes. One of those was to serve as a journal for my trip to the South Pole, if I ended up getting the job. Now that I have the job, I hope to share my adventures with friends and family and anyone else who is interested. I plan to update a few times a month with pictures, updates about what all is involved in my work at the South Pole, the science that we and others are doing down there, and even some personal things here and there. If anyone has questions feel free to post or email them to me. I will try to answer as I am able, especially over the next few weeks of training. After I "deploy" to the South Pole, the Internet will be limited, but I will still have access and will continue to post and answer questions, but it may take a little more time. In the mean time, the posts may be a little more frequent so I can get as much information out as possible. Recently, I was invited to give a talk at the Von Braun Astronomical Society. It was a wonderful experience. I am very passionate about science and astrophysics, and I am always excited to be able to share that passion with others in the community. In all honesty, when I was younger, I didn't appreciate those like Neil deGrasse Tyson and other "pop-physicists" who were so focused on scientific outreach. Over the years, however, I realized that what they do is so important. Given that there are so many people who are so ignorant about science, I think it is extremely important for us as scientists to try to reach out and share what we do and how science works with the people around us. That being said, my talk was about multi-messenger astronomy. The key point was that we are living in a very exciting time with regard to astronomical exploration. Man has been fascinated with the stars since the dawn of time. Then in the late 1500's, Galileo came along and pointed this new invention, the telescope, up toward the heavens, and he revolutionized science. I had a professor as an undergrad who said that the telescope was mankind's greatest invention, and I believe that there may be some truth in that. Since that time, we have used the whole of the electromagnetic spectrum from the very low energy energy cosmic microwave background radiation left over from the big bang all the way to the very energetic light of gamma rays from exploding stars to explore the universe. We have discovered so much about the universe since that time, and I am sure Galileo could not have even imagined some of the things we have found, from galaxies and black holes to dark matter and dark energy. Now, in the past few years, we have started to build new types of telescopes. We have begun to explore gravitational waves with the Laser Interferometer Gravitational Wave Observatory (LIGO). On top of that we have started to look for the tiniest of particles called neutrinos from the cosmos in experiments such as the IceCube Neutrino Observatory. These two new observatories, LIGO and IceCube, are looking into the heavens for the first time, just like when Galileo first pointed his telescope up into the sky. And just like Galileo, we have no idea what we will find. We are living in a very exciting time for the exploration of the universe and I look forward to our next steps! I have always loved the stars. I remember when I was a kid, I would go out with a cheap telescope and try to use it without really having any idea what I was doing. It was mostly enough for me to just be outside starring up at the night sky. At the time, I had no idea that I would ever actually end up studying astronomy and astrophysics in school or even end up now moving towards a career in astrophysics. But even when I was younger and considering other career paths, the stars always captivated me. I remember hearing people say that learning too much of the mechanics of something can detract from its beauty, but it was opposite with me. The more I have learned about astrophysics, the more captivated I can become when I step out on a clear night and just look up. Though, to be completely honest, sometimes I get a little complacent or jaded. I can get so wrapped up in looking through the telescope that I forget all the amazing beauty that I am seeing, but then out of nowhere it hits me afresh. That love of the stars and the inspiration will hit me when I least expect it. I had an experience like that last night. I went to VBAS, our local planetarium, for the public show. Usually, I don't get too much new information out of the public shows, but it can be nice to chat with people or maybe learn a few little things here and there that I have missed in my studies. But last night was interesting. The talk was about Jupiter. I find Jupiter to be a fun object to observe, mostly because you can actually see structure such as bands and moons. But last night for some reason, I had one of those inspirational moments where I was caught up in the beauty and majesty of Jupiter and its moons in a whole new way. The lecture wasn't particularly deep, and really, I am not sure I can quite put my finger on what was so amazing to me. Part of it was the thought of Jupiter out there with it's moons waiting for us to visit. The idea of an entire other planet so close to us and yet so far and so much larger than our small home world. The idea of future adventures that could allow mankind to one day branch out even farther in our exploration of of the stars. It was more than that, though. I remember hearing some of the facts and descriptions of the atmosphere and just trying to imagine what it would be like to travel down to the core of such a strange planet, and trying to imagine digging through the ice of the moons to see what is hiding down there. And then there was just something intangible that just kind of grabbed me through out the lecture. Something like hope, maybe, but not quite. 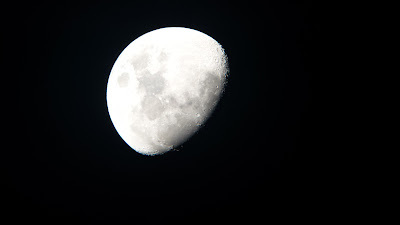 It's nights like last night that remind me why I have spent so much time studying astrophysics. I wish I could help other people see and feel what I did so they would understand how amazing and big our universe is. I want them to be inspired the way I am when I look up into the night sky. Hopefully, I will be able to better convey my awe and wonder as time goes on because our universe is truly an amazing place and there is still so much left to explore! It has been a while since I have tried to keep up a blog, so I am still not quite back in the habit of posting regularly. Though, to be honest, I am not sure my other blogs were updated quite as often as they should have been either. At any rate the past month has been quite interesting. I had a set of interviews up in Madison, WI for a job that I am interested in this past week. There are still a couple more candidates left to interview so it should be a few weeks before they make their final selections. One great thing about being in Madison was that I was able to get caught up with some IceCube collaboration friends I haven't seen in a while. There are a ton of wonderful people in the IceCube collaboration and in my time there I made many friends, but unfortunately, I haven't been able to see many of them in over a year. We still keep in touch on Facebook, but there is nothing like being able to sit down and visit and have a face to face chat with a good friend you haven't seen in a while. I have still been trying to get a bunch of reading done. I have almost finished a few more books. One I did finish was Black Holes And Time Warps by Kip Thorne. I think I started reading this book years ago, but I kept getting distracted so I never finished it. So I recently restarted it and was able to get through it in about a week or so. It really is a great book for someone with a physics background. I loved reading about the history of the development of various topics in physics and how so many branches and researches were intertwined. That much of the book should be enjoyable with any interest in physics at all. The physics was very basic for me, but could end up being a little difficult for others without much physics experience. Overall, I really enjoyed the book. I have also been reading a lot of physics papers. I still have a ton I want to read. One project I think I would like to do one day is to build an online collection of papers for grad students in particular. A listing of papers that are important for students to read as they enter particular research subjects, historical papers and review papers that are important to gain the basics of a subject or group of subjects. I think that would have helped me as grad student. I also have a few other computer/physics projects floating around in the back of my mind that I might try to work on soon, but I am not ready to even try to put down any real plans yet. I'm going to have to let them float around a bit and see where they land. The past week has been somewhat good. I found out I made it to the next interview for the job I want, and I was asked to be a godfather again for a couple of my best friends next child. Both of those are very exciting, and to be honest, I am not sure which I am more excited by. I have also been kind of busy with various other things. I decided to try to read a book a week this year... So far, I have only read three books. I am way behind! I could have sworn there was one more book I had read, but for the life of me, I can't figure out what it would have been. Overall, I don't feel like this is something I have to be too overwhelmed by if I don't meet my goals. Really, I just want to read more, and having a goal helps keep me motivated. While my books tend to be somewhat varied in nature, lately they are almost all at least semi-nonfiction. I say "semi" because one was a bit of a biographical fiction. It was mostly true, but with some details modified here and there to make it a little more allegorical. I have actually been going through some old physics text books as well. It has actually been fun reviewing without the pressure of school behind them. On that note, I am also thinking about doing some electronics review. I will probably spend some time on YouTube over the next few weeks watching electronics videos to get back into the grove of things. I have also been trying to keep active with yoseikan. I forgot how much fun it was, not to mention the added benefit of exercise. The past few weeks have been largely review as I haven't practiced in over five years, but I feel like I am not as far behind as I could be. I visited VBAS yesterday for the members meeting, and they had a talk about their expansion into radio astronomy. I am mildly interested in radio astronomy, so I may try to get involved some if time allows. I actually have a book on radio astronomy published by the ARRL that I started to read and never finished. I may have to bump it up on my list of priorities now! The past couple of weeks have been somewhat busy and exciting. I have been working on a few different things, and I haven't been able to really sit down and collect my thoughts for a post, but I think it is overdue, so I am going to give a quick update. Most excitingly, I had a phone interview for a position that I am very excited about. I am not going to go into much detail right now, but this would be a dream job for me. This week I expect to hear back and find out if I made it to the "onsite" interview. Overall, I think the phone interview went ok, but I am sure it could have gone better. I blanked on a couple of parts. The one that bothers me the most was the electronics questions. I don't have a ton of hands on experience with electronics, but I have some, and when I was being asked the questions, I started to overthink them. The first questions were so easy, I was afraid that I was missing something obvious, so I wasn't as confident in my answers as I should have been. Lesson learned. At any rate, I am optimistic, and if this doesn't work out, I am just going to have to keep looking for that next awesome job! I have also been doing a little more astronomy lately. I know I have already posted some on this. I went out again a couple of nights ago with an old friend of mine and did some observing. We spent the night hopping from one Messier object to another and discussing science, astronomy, and astrophysics. It was a ton of fun, and I think I was able to identify over 20 objects. I also visited VBAS and the UAH Astronomy Club a couple more times over the past few weeks. I think I am going to try to get trained on the VBAS telescopes. It would be nice to have that experience. Finally, I have also started to get back into Yoseikan. It is a martial art that I started taking years ago, but quit because I didn't have a place to study during grad school. It has allowed me to get a little more exercise, but in the process, I hurt my shoulder last week, so I have been a little sore. That being said, I have been enjoying it, and I hope to be able to continue it. 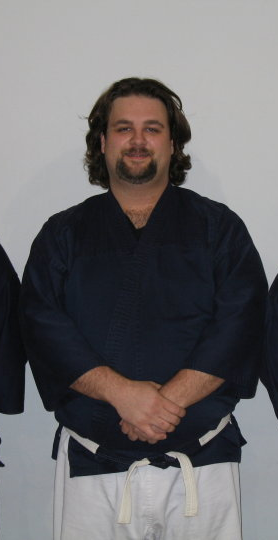 Here is an older picture (before they changed the gis and before I started grad school). Other than that, there have a been a few little things going on here and there, but I won't bore you with the details, at least not now! I am a strong proponent of Tor and Tails. I have used PGP (via GnuPG) off and on for years. For those unaware, these technologies are designed to protect anonymity and/or privacy on the internet. Each may get its own blog post in the future. So it feels a little odd starting a new website with the purpose of getting all my professional and even personal information out into the eye of the public. Personally, I do still try to browse anonymously using those technologies and a few others (which I will also post about in the future). I even run a Tor relay. I think that more people should be involved with the Tor project. So, I suppose the question is, "How do I reconcile my desire to remain somewhat anonymous with posting so much personal information?" I have been thinking, and at least in some respects it comes down to my ability to choose. I (mostly) choose carefully what gets posted on my website. I choose what I post on my blog and on social media. I have actually tried to be careful about what goes out to the interwebs about myself. I think it is perfectly fair for me to let people see certain aspects of my life without showing them every reddit post I read or every academic article I look at. One day we could have this same level of control over all of our data. We may be able to better choose what people see about our activities online. I think this is still a challenge waiting to be solved, and I am interested to see how it all plays out over the next several years! The LIGO collaboration announced today the detection of the first gravitational waves from the merger of two black holes. I originally started grad school wanting to work on gravitational research before joining the IceCube collaboration to do research on neutrinos and particle astrophysics, so I am especially excited to see the progress being made in gravitational astrophysics. The work being done by LIGO will provide a new way of exploring the universe through the observation of gravitational waves. Their announcement today is just the beginning of the work to come!